We talked with a modest trader from Germany Peter Becker. While he was getting comfortable with hist first interview ever, we learned from him who are benefiting from Bookmap and why this software is not for all traders. Sit back, relax, and read the story about persistent and hard-working trading — the true image of this profession. When and how did you start trading? I have been trading for eight years, totalling nine in 2019. I started trading in Europe with binary options by opening my own individual account. Initially, I was following the professional traders and managed to break even. However, I realized that I was trading blind. I asked my money back from the account and started reading books. Later, I started with spot FOREX market technique. I spent nearly thousands hours in front of the screen, but for the most part, the results were mediocre. Sometimes, I broke even, but for most of the time, I was losing money. After one year, I contacted the Internet forum futures.io and an American trader, living in Chicago. I wrote some emails, and he told me about the futures and options markets. The trader also told me about the depth of markets and global order books. I entered the futures market, but was unable to gain any consistent results and had to start from zero. I read a very detailed book on upside psychology, which changed my thinking dramatically. I also started looking for patterns, which is when I found the first version of Bookmap, version 6.0. I also saw a video about symmetry and microflows, which was impressive for me. Then I saw a dissertation work from Switzerland on the global order. The visibility of the liquidity is essential. Now, I trade the UK cash open and crude oil. Bookmap has saved me a lot of time, primarily through better visibility. Could you please speak of the features that are very hard to understand for the new traders? When they open Bookmap for the first time, what is the hardest thing to understand? I think, most of the time, new traders do not understand what they see. What does it mean when the price is moving very fast? What is going on when there is no volume, but the price is dropping 20 ticks? There is little idea about liquidity being supportive or resistant. Which party (market maker) pumps liquidity? The new traders have little idea about the strategy of the market maker. You have to understand the range on the bid side or the offer side, you have to experience the moving range in the market. The new traders are completely satisfied with the visibility, but they have to understand what is behind the data and information provided. Understanding of the market is essential, including an understanding of the orders, the reasons behind the downward and upward movements of price. In that regard, Bookmap provides access to historical data, such as liquidity from the previous days, which helps with explanations of the current tendencies. In addition, it is vital to move away from immediate large profits, concentrating on consistent small gains in the long term. Bookmap provided the seminar for us in the email so we could teach people about the order flow in general and Bookmap in particular. And when you open Bookmap for the first time, you understand nothing. When new traders have no idea what to look for, they are lost. Bookmap looks pretty easy at first: a nice graphic, dots, and colors, and you think that trading is easy too. 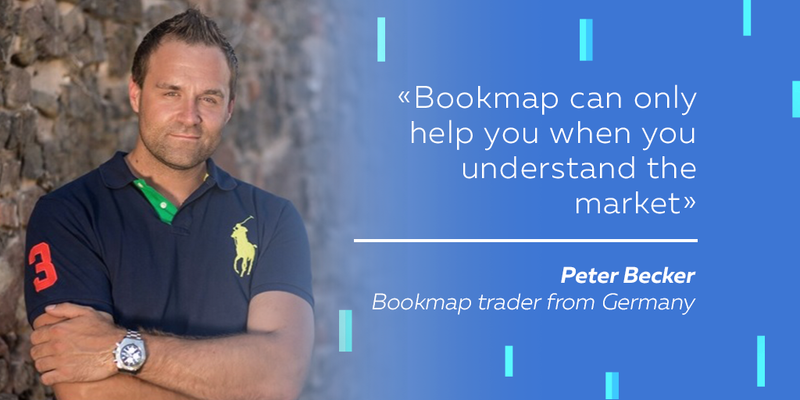 But when novice traders ask me: “How can Bookmap help me?” I answer: Bookmap cannot help you when you don’t understand the market. This is a very sophisticated tool and an ultra-fast and stable platform. The graphic is completely insane. I have tried all the heat maps available on the market, Sierra chart, JigSaw Trader, etc. With Bookmap, you feel comfortable on the platform, which is a great advantage, as you do not have any lag during the fast market moves. The price of the platform correlates with its stability. Usually, traders look where they can make fast money, which is an incorrect approach. The first question to answer is how Boopmap can make consistent profits in the future. Bookmap increases the probability of returns against losses in the long run. I have tried various platforms, and visibility is not as good as Bookmap. For example, with crude oil, when the liquidity is taken and you have a 90-degree move down, you have 5 seconds with Bookmap to determine whether the move was correct. The platform provides patterns, which are essential for trading. Bookmap removes the factor of the unknown. You stumbled and learned on a weekly basis. What is the ratio of red to green days and how do you correct your strategy? When I started trading, the worst days were Mondays and Fridays. Now, I know that these are the days when most of the options expire, or the market maker closes the position for the week. I watch the market every day for several hours, learning it. I trade mostly crude oil and S&P 500. You can show me a chart from gold or natural gas, and I would say that it is nice, but I don’t trade them. It is essential to learn the market before moving to any other one. Learning means knowing the disruptive styles of the markets. It is possible to avoid the worst days. Could you describe your work routine? When do you trade most of the time? I often wake up at 7:00, take a shower, drink two double espressos, walk out with my dog for about 30 minutes. At 8:50-8:55, I sit behind my desk and the machine starts: I read some news like Bloomberg and Reuters; I launch Bookmap and Sierra Charts. The first thing I consider the easiest, looking at what was going on in the night session. I evaluate various regions, their liquidity, absorption rates. Next, I look at the preliminary of the main session, like the NYMEX session, when the trade day ends for the big institutional traders. Only then I start my trade. The routine is the same every time from Monday to Friday. I have my notebook, my second keyboard, my water — it is my safe place. Consistency is the key. By changing the system on a daily basis, you are depriving yourself from to making profit. You mentioned that you start Bookmap, what are the other tools that you use? Apart from Bookmap as my main tool and Sierra Charts with the unique routing gateway, I also use accounting and trade service. The latter is a solid data feed for the traders with a large volume of contracts. I have had CTS (Sierra Charts) for four years, as I want to conduct execution from another platform. This is not a trust problem with Bookmap. It is my personal preference, as I feel more comfortable to have them separated. I do not need any other platform. As an experienced trader, you know what to search for, while the novice traders may be lost. What would you recommend for the experienced traders coming on Bookmap? I think it is easy for the experienced traders, since it is very intuitive. The indicators provided are sufficient for understanding of the market. As an experienced trader, you might need approximately two hours to understand Bookmap, including the potential implementation of the cloud settings, the volume imbalances, the correlation trackers, etc. Being new to trading, you might be lost. Bookmap needs more of experienced traders. But many experienced traders in Germany lack trust in new platforms because they used to focus on candlestick charts for 20 or 30 years. Bookmap needs more partners in the form of trustworthy traders. Awareness is the biggest advantage of Bookmap, allowing constant support and contacts for support. In-house coding of Bookmap ensures stability of the platform without crashes or any other issues. Do you care if more people come to the market? The market is very big, so more people coming changes nothing. When you trade 5 contracts in the S&P, you are not 1% of the daily volume. Individual trading makes very little difference in the market, unless you are a market maker. I try to take limited risks to avoid significant losses. What was your motivation for becoming a trader? Initially the motivation to be free, not being part of a company and more free time with my family and wife. I am happy to see my son grow. I am my own CEO, I make decisions to make profits on a daily basis. Do you think that when you reach a certain limit that would be enough for your family, you will stop trading, or would you continue? No, I will never stop trading. When you understand market mechanics deeply, it feels great, like having a superpower. You can make money nearly from nothing. As a professional trader, you can make sufficient profit the others may only dream about every day. You never stop trading after that. We usually ask our guests regarding their definition of a “great trader.” What does it mean to you? A trader is a person who is able to accept the risk and, more importantly, can handle the daily risk of the market. A trader knows exactly what’s a “risky” trade and what’s not. Being a trader is a process that needs time to grow, as most of the problems during the day are emotions. The market has no emotions; it’s a waste of time to blame the market for your losses. The next big thing is to be open for new things, open for the aspects and views of other traders. You can only learn to be better from real traders. Tell us about your trading strategy and instruments: why these? I trade mostly Crude Oil and the S&P 500. I like Crude Oil. My trading style is a combination of scalping and intraday swing trading. I like crude oil because it’́s a fast market with great moves and the S&P 500 is a little slower, which is a good combination. What is your attitude towards risk management? How much risk do you take per one trade? It depends on the entry point and the trading hours. When I trade crude oil during the UK Session, I can’t expect big moves; sometimes you have them but normally not. I take scalp traders in Crude Oil during the UK Session. The risk depends on my entry point, as I avoid entries around the VWAP or the POC. I try to catch a reversal when a resting flow is done, my normal stop is about 5 ticks, in volatile events — 10 ticks; and when I trade inventories I don’t use a stop, as it requires experience. The last 3 crude inventories I was on the right side, but I did not get a fill. That’s life. Have you ever panicked? How do you deal with extreme situations? When I started trading, it used to happen sometimes; but when you know the market movements, you don’t have panic. It’s a calculated risk, as news events like Donald Trump are unpredictable. Therefore, when you are on the right side, it’s nice, when not — it’s unfortunate. So don’t be mad, the market and Donald have nothing against you. Can you name your biggest mistake? What are the most common mistakes traders do? I started trading in the other markets, rather than the futures market, and spent a lot of money for indicators that were presented as the “Holy Grail”. What traders do you admire, if any? Hard question but it’s John “Rambo“ Moulton and Ray Dalio (not a Trader specifically). Michael Burry is also a great head, he is the fund manager who made a lot of money in 2008. I “admire” him not for the money that he made with the mortgage crisis, he has shown that your mind and experience can show you the way. The Ray Dalio principles are also great. Do you use the order flow in trading? How? Orderflow is a modern word. I think my trading is pretty easy to describe: I buy when the price goes up and vice versa. I look at imbalances of bid and ask, or the fast market moves. Big part of my trading is the resting order from the Market Makers. What’s your philosophy and what are your plans for the future? I don’t have many specific philosophies. It would be nice if this unbearable envy in trading would stop and the keyboard heroes would concentrate on important things. It’s quite adventurous in Germany, as everybody knows everything better and they are the best ones. It is a rather one-sided view that doesn’t help the people in their trades. I do not have any special plans for the future, I like it the way it is. I like to meet new people and try to help many so that their trading gets better. I know I can’t help everyone, but if some of them learn to “see” through me, I’ve already achieved something. Do not be the fool of chance or randomness. On a final note, do you have any other thoughts you would like to share? What I would like to say for the new traders is spend $50 for a notebook and write down your emotions. You have to control your emotions in trading. Stress results in production of cortisol, leading to tunnel vision costing you money. Traders have to lose fear for the market, which is amongst the most important messages for the new traders.